Jim Lucas and Jennifer Mole, and their two daughters, Indie, 8, left, and Tilly, 6, in their home in Coldingham, Scotland. COLDINGHAM, Scotland — The surprising thing about visiting Sunnybank, a light-drenched home in Coldingham, a picturesque village near Scotland’s southeast coastline, is that its entrance is barely visible. That detail, admits Jim Lucas, one of the home’s owners, was quite deliberate. Mr. Lucas wanted the stone facade facing the street to lend an element of surprise for what was to come. “Then, as you walk into the house you’ve got this canvas of glass providing you with your own perfect viewing platform to experience the countryside beyond,” said Mr. Lucas, 43, who shares the home with Jennifer Mole, 43, and their two daughters, Indie, 8 and Tilly, 6. The rectangular two-story home, carved into the steep slope of a hill, features a row of four bedrooms arranged one level above an open area that includes living and dining rooms and a galley kitchen. Both floors overlook a wildflower garden complete with a vegetable patch, fruit trees, and a tennis court. The house is not only eye-catching in its dramatic cantilevered form, it is also designed to meet the energy-efficient performance standards of a passive house, which combines airtight construction and minimal energy consumption. The house doesn’t require a heater or an air-conditioner; a mechanical ventilation system exchanges interior and exterior air. 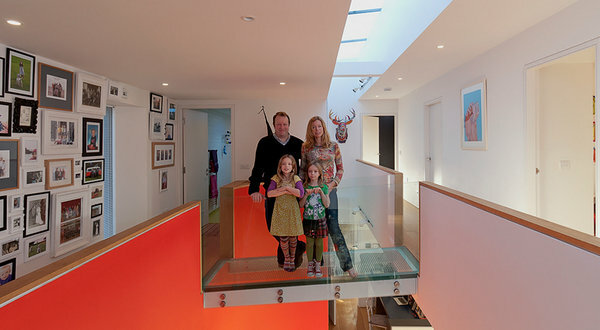 Yet building a passive house had not entered the minds of Mr. Lucas and Ms. Mole, a stay-at-home mother, when in 2007 they started looking for properties in their native Scotland from their three-bedroom Georgian terraced house in the South London district of Greenwich. Serendipitously, Mr. Lucas spotted the site of what would be the family’s new home while pursuing his hobby: buying, renovating and selling houses all over the United Kingdom. “The site was fantastic — a bungalow with about two acres of land, in the middle of a lovely village, right next to the school, and a few miles from Jennifer’s parents, ” he said. They bought the site in 2007, demolishing the existing property, but keeping its name, Sunnybank. Mr. Lucas and Ms. Mole collaborated on the design of the house with Tony Lucas, an eco-conscious principal of London-based Venner Lucas Architects, who had previously worked with the couple on the refurbishment of their Greenwich home. The architect suggested they use environmentally friendly techniques developed by the Passivhaus Institut in Germany more than a decade ago. The family moved into the home around Christmas 2009, following 16 months of construction that cost $955,858. Sunnybank is almost hidden, tucked back as it is off the street and behind a gate. From the driveway, a narrow stone path leads to the home, whose front exterior is whinstone, a dark-colored rock reclaimed from Ms. Mole’s family farm. Once inside, the house opens up as a light-filled revelation with a skylight running along the length of the rectangular building. From the front door, a long narrow entrance corridor also runs the length of the front of the house. Off this corridor, with stark white walls lined with family photos, are the family and master bathrooms. The corridor is linked to a parallel bedroom corridor in the cantilevered rear of the home by a short glass bridge. A wooden staircase, just past the front door, descends to the heart of the open plan living area. The kitchen and dining area are to the right , while the living room and playroom take up the remainder of the space. All the main rooms on both levels have southern exposure to take advantage of the natural light and feature glass walls and sliding doors with a view of the garden and countryside beyond. Hiding clutter is the raison d’être behind many of Sunnybank’s features, including built-in storage, a utility room on the lower level with a laundry chute connected to the lime-green family bathroom above. “Although I’m still picking up clothes from the bathroom floor,” Ms. Mole said with a smile. The couple said their daughters are enamored by the idiosyncratic touches to the home, like the glass bridge and the wooden staircase, one side of which they delight in sliding down. “When the kids’ friends come to visit they immediately run around having fun, feeling at home,” Mr. Lucas said. “We’ve put in lots of durable things like solid wood floors, and tiles, so it’s a house to be used and abused, so to speak. And for a Modernist build, which can be quite stark, it’s a very family orientated, very relaxed home.” Mr. Lucas, with his commonsensical approach, and Ms. Mole, with her environmental awareness, said they had labored for many weeks over requirements for their new house. But in the end, their passive house met their needs. “It fits in perfectly with the way that we live,“ he said.